Don't pay attention to errors and warnings. I try to integrate Swift code in my app.My app is written in Objective-C and I added a Swift class. I've done everything described here. But my problem is that Xcode haven't created the -Swift.h file, only the bridging headers. So I created it, but it's actually empty. I can use all my ObjC classes in Swift, but I can't do it vice versa. I marked my swift class with @objc but it didn't help. What can I do now? EDIT: Apple says:" When you import Swift code into Objective-C, you rely on an Xcode-generated header file to expose those files to Objective-C. [...] The name of this header is your product module name followed by adding “-Swift.h”. " var descr = "FBManager class"
Allow Xcode to do its work, do not add/create Swift header manually. Just add @objc before your Swift class ex. Make sure your project defines a module and you have given a name to the module. Then rebuild, and Xcode will create the -Swift.h header file and you will be able to import. You can set module definition and module name in your project settings. The file is created automatically (talking about Xcode 6.3.2 here). But you won't see it, since it's in your Derived Data folder. After marking your swift class with @objc, compile, then search for Swift.h in your Derived Data folder. You should find the Swift header there. I had the problem, that Xcode renamed my my-Project-Swift.h to my_Project-Swift.h Xcode doesn't like "." "-" etc. symbols. With the method above you can find the filename and import it to a Objective-C class. If the compiler can not find your header file Swift code, try to compile the project. You need to create bridging header file. 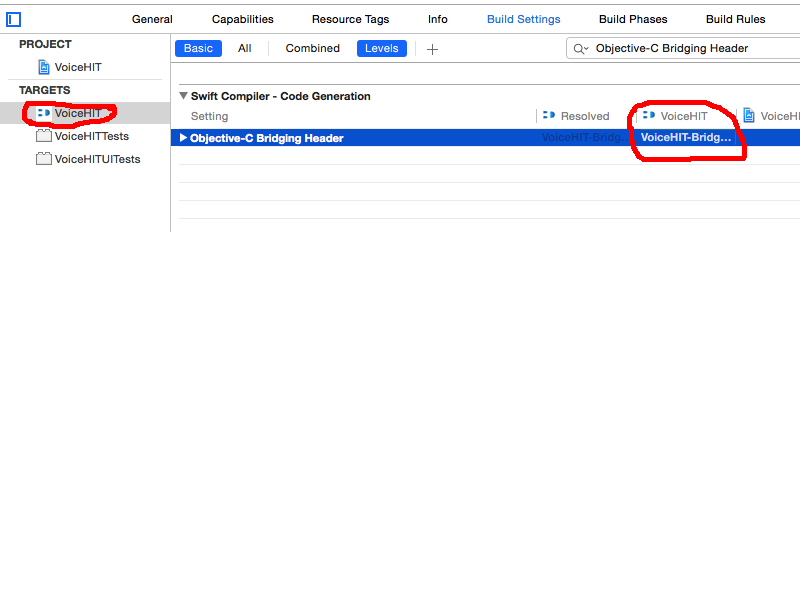 When you add Swift file in Objective-C project, or Objective-C file in swift project Xcode will suggest you to create bridging header. Full integration steps Objective-c and Swift described above. Now I will write some other code examples. The last point (5) was crucial. I put it only on the second section (Targets field), the Project field should be left empty: Otherwise, it did not generate the right "Project-Swift.h" file for me (it did not include swift methods). I have the same error: myProjectModule-Swift.h file not found", but, in my case, real reason was in wrong deployment target: "Swift is unavailable on OS X earlier than 10.9; please set MACOSX_DEPLOYMENT_TARGET to 10.9 or later (currently it is '10.7')" so, when I've changed deployment target to 10.9 - project had been compiled successfully. you see what xcode created. I didnt have to change any settings in the build or add @obj to the class. import "Bedtime-Swift.h" <- inside objective-c file that needed to use that swift file. After doing everything above, I still got errors. My problem ended up being that the Swift files I needed weren't added to the bundle resources for some reason. I fixed this by going to [MyTarget] > Build Phases > Copy Bundle Resources, then clicked the plus button and added the Swift files.